The human brain generates several types of energy waves which pulsate at different speeds. Alpha brain waves are slow, and scientific research has proven that when people are in the “alpha state”, they receive more oxygen return to the brain, allowing them to rest or sleep more peacefully and deeply. BETA activity takes place when a person is wide awake. It's frequency is 13Hz per second and above. ALPHA brain waves occur when a person relaxes. 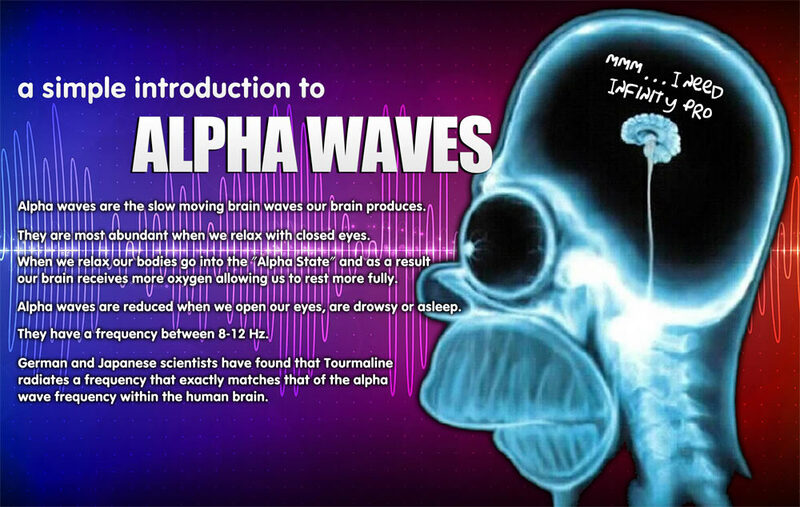 The Alpha rhythm is between 8-12hz brain waves per second. THETA is a slow activity and is represented by a frequency of 3.5Hz - 8Hz per second. DELTA brain waves occur when the individual is sleeping. It's rate of frequency is 1.5Hz - 4Hz per second. German and Japanese scientists have discovered that Tourmaline can radiate an frequency of 8-12Hz per second, which matches exactly to the alpha wave frequency in the human brain.